In my inaugural post for "Harvest Gold Memories" (see http://goo.gl/xc3S4 for that), I observed that Generation X ("Gen X") had officially reached middle-age, with several commercials clearly aimed at us as a group. Having said that, I would much rather be middle-aged than in my twenties. It's what comes next that's scary (although retirement should be great)! 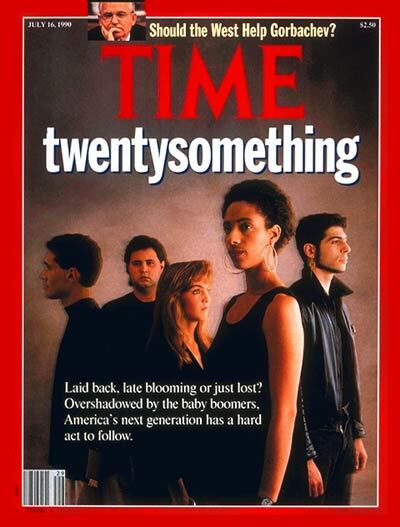 Still, for Gen X, our moment in the spotlight is seen as long overdue, but is also bitter-sweet. 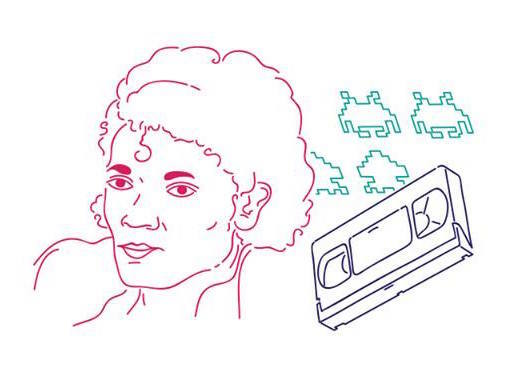 For Gen X's entire existence, we've lived in the shadows of the enormous Baby Boom, and we were force-fed their experiences via pop-culture, music and politics. Advertisers conveniently ignored us, although few of us felt very bad about that. When we came of age in the early 1990s, we finally got a brief moment in the spotlight (check out the July 16, 1990 issue of Time magazine by visiting http://ti.me/5gQ3tM), and our music dominated the airwaves. But that wouldn't last very long, and nowadays, "the airwaves" isn't even the only place where music can emerge as successful. The world has changed, which is great, although I've lamented about the loss of a collective pop culture experience with television (see http://goo.gl/l4Z85), for example, although we see signs of that re-emerging now with social media (notably via Twitter) enabling that experience to be shared in a new way. Having said that, as the Baby Boom heads off into the sunset, they no longer dominate sales for many consumer products categories, hence advertisers could no longer concern themselves exclusively with what Baby Boomers wanted. A prime example: baby products like diapers aren't pitched to grandparents (Depends, maybe, but not Pampers, Luvs and Huggies). However, these days, advertising clearly aimed at Gen X with music we may recall from our youths is now widespread. Companies ranging from Mazda to Procter & Gamble to Visa (indeed, Gen X has surpassed Baby Boomers on credit card usage according to researchers, see http://bit.se/V6dUmr for details) have their sights on Gen X until they're prepared to move on to Millennials. "I mean this is a generation that is really first to have worked to live rather live to work, and they don't take themselves so seriously all the time and they appreciate brands who recognize that and recognize their lifestyle and sensibilities and have that same type of attitude like Honda." While Gen X may be at the top of the advertising food-chain for the moment, none of us is naïve enough to presume we'll be there for long. After all, there are more Millennials than Baby Boomers, and they're right behind us. However, in some ways, Gen X has more similarities with Millennials than we do with Baby Boomers. For example, having started social media giants like Facebook and Twitter, Gen X knows these things as well as Millennials do. And, we are just as likely to have smartphones as Millennials (indeed, we're the ones that started dumping landlines seeing them as duplicative), although we may need our reading glasses to see the tiny screens! Still, it's kind of nice to be recognized. 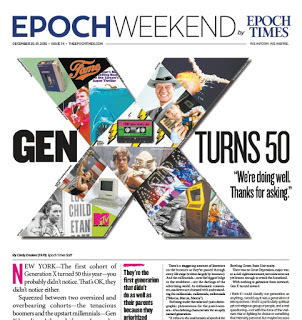 Author P.S., December 30, 2015: The newspaper Epoch Times Weekend edition had a nice article about Gen X turning age 50. A picture of the headline is below (you can click on the photo and be taken to the article online), although the link to the article is http://www.theepochtimes.com/n3/1925959-gen-x-turns-50-were-doing-well-thanks-for-asking/.